This popular grilled asparagus recipe has been tested to perfection. It's been "tested" so often in fact that I'm a little surprised my family isn't sick of it yet. But they keep on coming back for more! 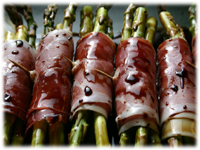 This simple way of grilling asparagus is ready in minutes, just wrap the asparagus in cheese and prosciutto and marinate in balsamic vinegar before grilling. Let the cheese just begin to melt, usually by that time the prosciutto is getting crispy and the asparagus is getting nicely charred. The salty prosciutto adds so much flavor to this great BBQ side dish. Note, for best results let the asparagus sit in the balsamic marinade about an hour before grilling. Pre-heat grill to medium-high (400F) and set up for direct heat grilling. 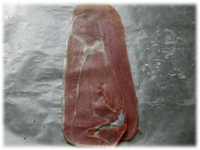 Lay a slice of prosciutto ham on your working surface. Tip: I've tried practically every type of cured meat possible for these and find the long strips of prosciutto pictured here the best. They're long enough to completely wrap the asparagus and strong enough not to break. Other options like panceta are more fragile and break mid-cooking with the cheese leaking out on your grill. Place a slice of provolone cheese on the prosciutto and sprinkle 1/2 tablespoon lemon pepper and 1/2 tablespoon garlic powder over the entire length of prosciutto/cheese. 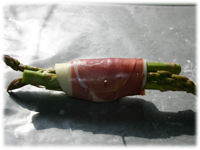 Place 4 spears of asparagus 1" from the end of the prosciutto closest to you. 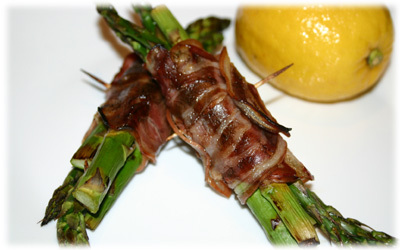 Alternate the tips of the asparagus so 2 stick out the left and 2 stick out the right side. 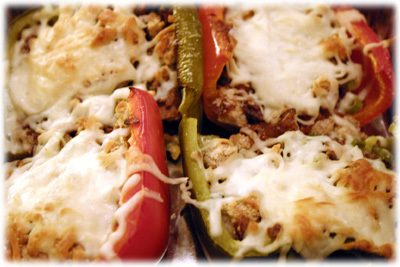 Variation: If you can't find provolone cheese (or don't like it) most anything works. Try fresh grated parmesan, swiss, gruyere, havarti or old cheddar. Tip: You can make your own lemon pepper by drying the zest of 1 lemon in the oven on a cooking sheet on low (275F) for an hour and then mixing with a suitable amount of ground black pepper. Either that or just put the lemon zest in the bundles with the black pepper and you're good to go! 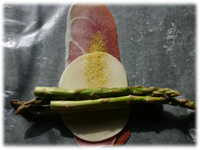 With the asparagus, cheese and spices over the prosciutto, pickup the 1" of prosciutto closest to you and begin to wrap it over the asparagus. With your other hand grip the asparagus to keep it tight and continue rolling up the entire bundle. Keep the bundle as tightly wrapped as possible. You don't want it falling apart during grilling. Secure the bundle with a toothpick inserted in the center from one side through to the other. 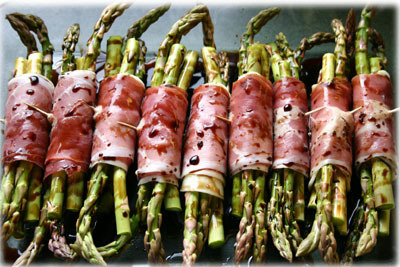 Place the asparagus bundles in a 9 x 13 glass dish (or a thick plastic freezer bag). Pour the 1/4 cup balsamic vinegar evenly over all bundles. Cover and let marinate in refrigerator for at least 1 hour. When ready to grill place the bundles on the pre-heated grill over direct heat. If you have one of those narrow elevated shelves in your grill put them up there to cook. Lift the lid and check the bottom of a bundle for grill marks and see if the cheese is beginning to melt. If yes, then flip the bundles very gently with bbq tongs. Close the lid and wait another 5 minutes. Lift the lid and if the prosciutto is getting crispy and the cheese is melting nicely remove the bundles to a serving tray. Consider grating fresh parmesan over the cooked asparagus bundles before covering with aluminum foil until ready to serve.